Las Vegas, Nevada — The man hunt for a young boy that butchered his mom and younger brother is over. 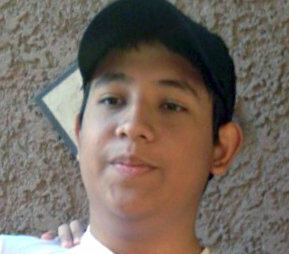 Navarro Canales, 16, was founding sitting alone inside of a food court in Las Vegas. Canales was just sitting at a table and detectives were able to walk right up and take him into custody without incident. Canales was booked into the Clark County Detention Facility where he will await his first court appearance. After brutally stabbing his mom and younger brother with a large butcher knife, Canales walked nine miles to the Las Vegas Strip. Navarro Canales a non-U.S. citizen, will be charged as an adult for the killing of Elvira Canales-Gomez, 40, and Cesar Navarro, 9. Canales was first thought to be a victim, but after Gomez’s niece, Ana, Martinez, 23, told police that her cousin was anti social, didn’t have friends, and wanted to go back to Mexico because he hated the United States, he was named as a person of interest. Gomez was found in a pool of blood with multiple stab wounds to her chest, and his younger brother Navarro, had been stabbed once in the chest then placed in the bathtub. This investigation is still ongoing and a motive for the brutal murders has not yet been determined.